Autonomous unmanned aerial vehicles (UAVs) now swarm together in surveillance tasks. A small flock of prototype multiple-rotor radio-controlled aircraft are being taught basic surveillance strategies. Project leader Jonathan How at MIT is looking at ways for swarms of UAVs to conduct persistent surveillance of an object or set of objects - like a truck convoy. The UAVs are also able to land on moving vehicles for recharging. UAVs take turns tracking objects; a small swarm of these "birds" can perform long-term surveillance. 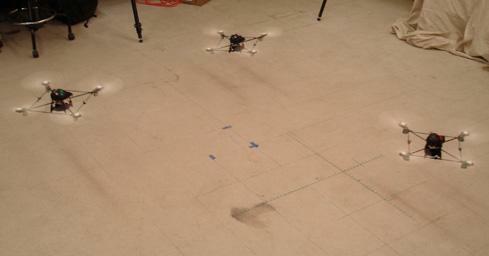 At any given time, some of the UAVs might be recharging or performing other tasks. Another interesting science-fictional look at how a flock of UAVs might track an object is demonstrated in the tracer birds from author Roger Zelazny's excellent 1980 story Changeling. Thanks to Vik for the tip on this story; read a bit more here.